I first stumbled across American monologuist and actor Spalding Gray's autobiographical work in the late 80s when the filmed performance (directed by Jonathan Demme) of his monologue, Swimming to Cambodia, was shown on TV. Just Spalding, sitting at a desk in a plaid shirt, talking about his experiences in Southeast Asia while playing an ambassador's aide in The Killing Fields. If I had any idea who he was when I first encountered Swimming to Cambodia it would've only been because of Spalding's acting roles in movies like Beaches, Clara's Heart and (of course) The Killing Fields. But I was instantly hooked on his unique brand of storytelling filled as it was with keen observations, much angst, confessional humour and a constant underlying sense of the bittersweet nature of life. So revealing is Spalding Gray in his monologues that I almost felt like I knew him by the time he died in 2004 (He was last seen on the Staten Island ferry on January 10th of that year and his body was pulled from the East River roughly two months later). 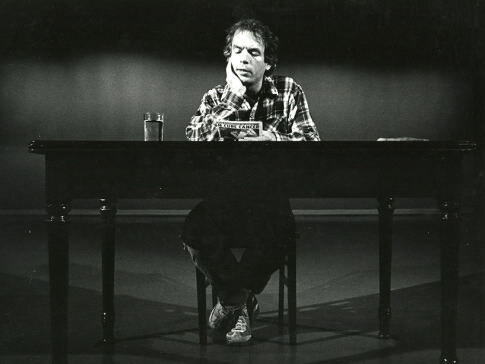 Over the years I was lucky enough to see two of Spalding Gray's monologues live—Monster in a Box in the early nineties in Toronto and It's a Slippery Slope in Dublin in the late nineties. I also enjoyed his novel, Impossible Vacation, and his monologues Terrors of Pleasure and Gray's Anatomy, which I still have VHS copies of. I was hoping to see more of him over the years and watching And Everything is Going Fine, a documentary about Spalding Gray composed mainly of clips of Spalding talking about his life and work (the two seem indivisible), is like one final visit with the great monologuist. I'm thinking now, of my very favourite moment in Impossible Vacation, when main character Brewster North entertains a six-year-old child. I reached down and took the pillow that Shanti was sitting on and lifted him up from the couch real high and held him there, as if he were flying on a magic carpet, then I let go of the pillow and dropped him. Shanti squealed and let out with a wild laugh as he and the pillow hit the floor and bounced; and then, making an immediate recovery, Shanti jumped back on the pillow and cried out, "Do it again!" I made up my mind right away to try to totally satisfy him so that perhaps for once in his life at an early age, he would know the condition of complete indulgence and satisfaction. He would have no leftover longings; at least for this day he'd be cured of the longing for the event that never happened. I'm thinking how we'll never hear more stories from Spalding Gray. We will never be cured of the longing for the event that will never happen. And Everything is Going Fine closes at the TIFF tomorrow.